Although most buyers are keenly interested in product features and functionality, factors related to company performance also matter. This report analyzes eight company-related factors—such as reputation, service and support, and vendor financial viability—that buyers use when evaluating vendors in competitive B2B sales opportunities. 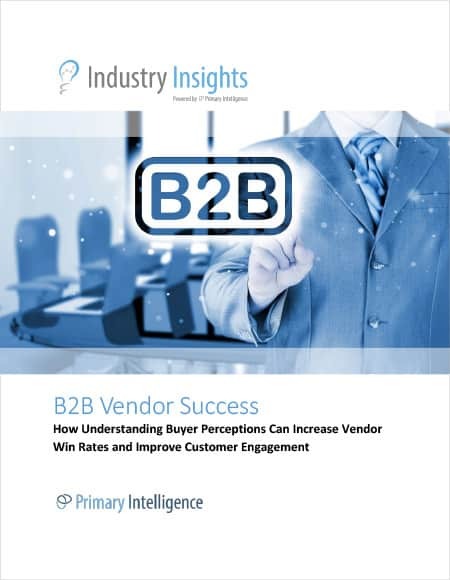 B2B Vendor Success is a guide for sales and marketing leaders to better understand buyer perceptions of company-based factors that influence purchase decisions. What company-related factors should I focus on when selling to buyers so that I address the issues they’re most concerned with? What are buyer perceptions when they consider the future direction of most B2B organizations? How does this change by vertical industry? Or geographic region? How important is it for my sales team to highlight our experience in a prospect’s industry? How can we better deliver what was sold to our buyers so they’ll purchase from us in the future? Do most buyers care about the size of B2B organizations? If so, how can I mitigate against negative perceptions that our firm is too big, or too small? Do customer references really make a difference? How are firms in my industry perceived in terms of the overall quality of customer references we provide?